How to Linking a User to a Nintendo Account - Nintendo Switch is a console everyone can enjoy. Each person can create a user on the console which will store their save data when they play Nintendo Switch. If you link a user to a Nintendo Account, you can use internet features like Nintendo eShop and friend features. You can create up to eight users on a single console. You can add a user to the console by opening System Settings on the HOME Menu and selecting User ⇒ Add New User. Deleting a user from the console will also delete all of that user's save data. You can delete a user by going to System Settings ⇒ User and selecting "Delete User". 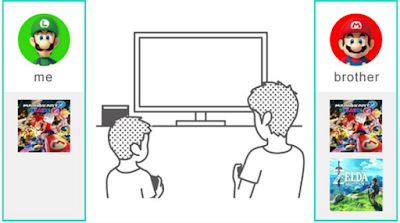 A Nintendo Account enables the use of My Nintendo services and certain smart device applications. On the Nintendo Switch console, linking a user to a Nintendo Account lets you use online features. You must be aged 13 or over to create a Nintendo Account. You'll need an adult to create an account for you if you are 12 or under. With the exception of certain software and services, membership will be required for online play using your Nintendo Switch console. You can try this service for free until autumn 2017. A Nintendo Account (free of charge) is required to use this service. You will need to register your console as the active console for downloads for your Nintendo Account if you want to make purchases in Nintendo eShop. 1. Connect the console to the internet. 2. Touch the user icon on the HOME Menu to go to your user page, then select Profile ⇒ Link to a Nintendo Account. 3. Follow the on-screen instructions to link your Nintendo Account.